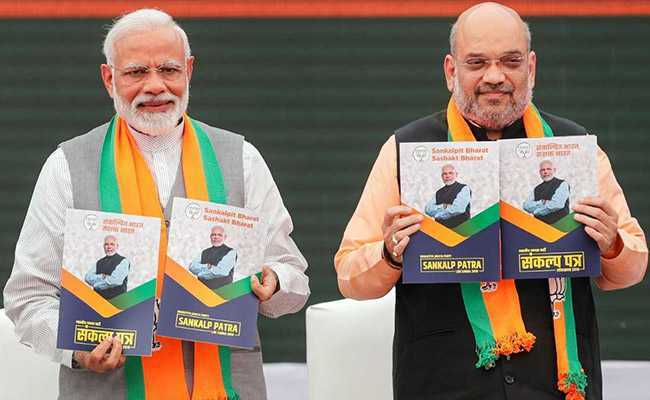 New Delhi: Prime Minister Narendra Modi called his party's manifesto or Sankalp patra, a document promising good governance, security and prosperity of the country. BJP chief Amit Shah in his introductory message claimed that India is a "maha-shakti" now. During the period between 2004 and 2014, when UPA was in power, India had "slipped in the eyes of the world" but now it is among the top six economies, he said, adding that PM Modi has done justice to every sector of the society, by giving cooking gas connections in rural areas, housing and affordable healthcare for all and welfare schemes for farmers. While bringing the economy on track, the Prime Minister has shown the world how a scam-free country can be run said Amit Shah. "PM Modi has struck the source of terrorism and sent a message to the world that no one can play around with the borders of the country," Amit Shah said.